Liberalism is the belief in freedom and equal rights generally associated with such thinkers as John Locke and Montesquieu. Liberalism as a political movement spans the better part of the last four centuries, though the use of the word liberalism to refer to a specific political doctrine did not occur until the 19th century. The Glorious Revolution of 1688 in England laid the foundations for the development of the modern liberal state by constitutionally limiting the power of the monarch, affirming parliamentary supremacy, passing the Bill of Rights and establishing the principle of 'consent of the governed'. The 1776 Declaration of Independence of the United States of America founded the nascent republic on liberal principles without the encumbrance of hereditary aristocracy; the declaration stated that "all men are created equal and endowed by their creator with certain unalienable rights, among these life, liberty, and the pursuit of happiness," echoing John Locke's phrase "life, liberty, and property". A few years later, the French Revolution overthrew the hereditary aristocracy, with the slogan "liberty, equality, fraternity", and was the first state in history to grant universal male suffrage. The Declaration of the Rights of Man and of the Citizen, first codified in 1789 in France, is a foundational document of both liberalism and human rights. The intellectual progress of the Enlightenment, which questioned old traditions about societies and governments, eventually coalesced into powerful revolutionary movements that toppled ancient regimes all over the world, especially in Europe, Latin America, and North America. Liberalism fully exploded as a comprehensive movement against the old order during the French Revolution, which influenced later events on the European continent and around the world. The Classical liberalism espoused by Adam Smith, John Stuart Mill and others, broadly emphasized the importance of free markets, civil liberties and laissez-faire style governance with a minimum of interference - this approach dominated the liberal tradition during the 19th century. The widening disparity between rich and poor in the late 19th century, especially in England and Germany, began a trend toward social liberalism that emphasized a greater role for the state in ameliorating devastating social conditions. By the beginning of the 21st century, liberal democracies and their fundamental characteristics—support for constitutions, free and fair elections and pluralistic society—had prevailed in most regions around the world. 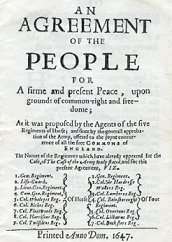 The Agreement of the People (1647) was a manifesto for political change, proposed by the Levellers during the English Civil War. It called for freedom of religion, frequent convening of Parliament and equality under the law. To every Individuall in nature, is given an individuall property by nature, not to be invaded or usurped by any...; no man hath power over my rights and liberties, and I over no mans. Algernon Sidney was second only to John Locke in his influence on liberal political thought in eighteenth-century Britain and Colonial America, and was widely read and quoted by the Whig opposition during the Glorious Revolution. Sidney's argument that "free men always have the right to resist tyrannical government" was widely quoted by the Patriots at the time of American Revolutionary War, and Thomas Jefferson considered Sidney to have been one of the two primary sources for the Founding Fathers' view of liberty. Sidney believed that absolute monarchy was a great political evil, and his major work, Discourses Concerning Government, was written during the Exclusion Crisis, as a response to Robert Filmer's Patriarcha, a defence of divine right monarchy. Sidney firmly rejected the Filmer's reactionary principles and argued that the subjects of the monarch were entitled by right to share in the government through advice and counsel. John Locke was the first to develop a liberal philosophy. He coherently described the elementary principles of the liberal movement, such as the right to private property and the consent of the governed. These ideas were first drawn together and systematized as a distinct ideology, by the English philosopher John Locke, generally regarded as the father of modern liberalism. Thomas Hobbes had developed the concept of the social contract, according to which, individuals in the anarchic and brutal state of nature came together and voluntarily ceded some of their individual rights to an established state authority, which would create laws to regulate social interactions. Whereas Hobbes advocated a strong monarchical authority (the Leviathan), Locke developed the then radical notion that government acquires consent from the governed which has to be constantly present for the government to remain legitimate. His influential Two Treatises (1690), the foundational text of liberal ideology, outlined his major ideas. 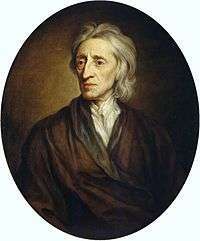 Once humans moved out of their natural state and formed societies, Locke argued as follows: "Thus that which begins and actually constitutes any political society is nothing but the consent of any number of freemen capable of a majority to unite and incorporate into such a society. And this is that, and that only, which did or could give beginning to any lawful government in the world." The stringent insistence that lawful government did not have a supernatural basis was a sharp break with the dominant theories of governance, which advocated the divine right of kings, and echoed the earlier thought of Aristotle. One political scientist described this new thinking as follows: "In the liberal understanding, there are no citizens within the regime who can claim to rule by natural or supernatural right, without the consent of the governed". Locke had other intellectual opponents besides Hobbes. In the First Treatise, Locke aimed his guns first and foremost at one of the doyens of 17th century English conservative philosophy: Robert Filmer. Filmer's Patriarcha (1680) argued for the Divine Right of Kings by appealing to biblical teaching, claiming that the authority granted to Adam by God gave successors of Adam in the male line of descent a right of dominion over all other humans and creatures in the world. Locke disagreed so thoroughly and obsessively with Filmer, however, that the First Treatise is almost a sentence-by-sentence refutation of Patriarcha. Reinforcing his respect for consensus, Locke argued that "conjugal society is made up by a voluntary compact between men and women". Locke maintained that the grant of dominion in Genesis was not to men over women, as Filmer believed, but to humans over animals. Locke was certainly no feminist by modern standards, but the first major liberal thinker in history accomplished an equally major task on the road to making the world more pluralistic: the integration of women into social theory. John Milton's Areopagitica (1644) argued for the importance of freedom of speech. Locke also originated the concept of the separation of church and state. Based on the social contract principle, Locke argued that the government lacked authority in the realm of individual conscience, as this was something rational people could not cede to the government for it or others to control. For Locke, this created a natural right in the liberty of conscience, which he argued must therefore remain protected from any government authority. He also formulated a general defence for religious toleration in his Letters Concerning Toleration. Three arguments are central: (1) Earthly judges, the state in particular, and human beings generally, cannot dependably evaluate the truth-claims of competing religious standpoints; (2) Even if they could, enforcing a single "true religion" would not have the desired effect, because belief cannot be compelled by violence; (3) Coercing religious uniformity would lead to more social disorder than allowing diversity. Locke was also influenced by the liberal ideas of Presbyterian politician and poet John Milton, who was a staunch advocate of freedom in all its forms. Milton argued for disestablishment as the only effective way of achieving broad toleration. Rather than force a man's conscience, government should recognise the persuasive force of the gospel. As assistant to Oliver Cromwell, Milton also took part in drafting a constitution of the Independents (Agreement of the People; 1647) that strongly stressed the equality of all humans as a consequence of democratic tendencies. 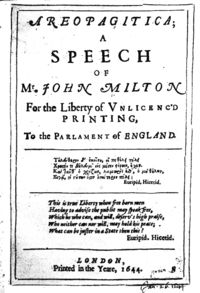 In his Areopagitica, Milton provided one of the first arguments for the importance of freedom of speech - "the liberty to know, to utter, and to argue freely according to conscience, above all liberties". His central argument was that the individual is capable of using reason to distinguish right from wrong. To be able to exercise this right, everyone must have unlimited access to the ideas of his fellow men in “a free and open encounter", and this will allow the good arguments to prevail. The Bill of Rights was a landmark piece of liberal legislation. The impact of these ideas steadily increased during the 17th century in England, culminating in the Glorious Revolution of 1688 which enshrined parliamentary sovereignty and the right of revolution, and led to the establishment of what many consider the first modern, liberal state. Significant legislative milestones in this period included the Habeas Corpus Act of 1679 which strengthened the convention that forbade detention lacking sufficient cause or evidence. The Bill of Rights formally established the supremacy of the law and of parliament over the monarch and laid down basic rights for all Englishmen. The Bill made royal interference with the law and with elections to parliament illegal, made the agreement of parliament necessary for the implementation of any new taxes and outlawed the maintenance of a standing army during peacetime without parliament's consent. The right to petition the monarch was granted to everyone and "cruel and unusual" punishments were made illegal under all circumstances. This was followed a year later with the Act of Toleration, which drew its ideological content from John Locke's four letters advocating religious toleration. The Act allowed freedom of worship to Nonconformists who pledged oaths of Allegiance and Supremacy to the Anglican Church. The Act, however, did not apply to Catholics and non-trinitarians, who remained excluded from political office. The Licensing of the Press Act 1662, which sanctioned government censorship of the printing press, expired in 1692 at the end of the existing session of parliament. In 1695 the Commons refused to renew the legislation, leading to a continuous period of unprecedented freedom of the press (apart from seditious libel). The development of liberalism continued throughout the 18th century with the burgeoning Enlightenment ideals of the era. This was a period of profound intellectual vitality that questioned old traditions and influenced several European monarchies throughout the 18th century. Joseph II of Austria was an archetypal enlightened despot. Although he maintained a belief in absolutist monarchy, he championed a series of liberal reforms. 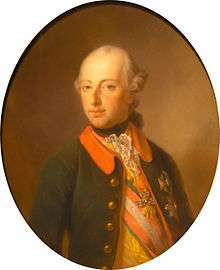 A prominent example of a monarch who took the Enlightenment project seriously was Joseph II of Austria, who ruled from 1780 to 1790 and implemented a wide array of radical reforms, such as the complete abolition of serfdom, the imposition of equal taxation policies between the aristocracy and the peasantry, the institution of religious toleration, including equal civil rights for Jews, and the suppression of Catholic religious authority throughout his empire, creating a more secular nation. Besides the Enlightenment, a rising tide of industrialization and urbanization in Western Europe during the 18th century also contributed to the growth of liberal society by spurring commercial and entrepreneurial activity. In the early 18th century, the Commonwealth men and the Country Party in England, promoted republicanism and condemned the perceived widespread corruption and lack of morality during the Walpole era, theorizing that only civic virtue could protect a country from despotism and ruin. A series of essays, known as Cato's Letters, published in the London Journal during the 1720s and written by John Trenchard and Thomas Gordon, condemned tyranny and advanced principles of freedom of conscience and freedom of speech. They were an important influence on the development of Republicanism in the United States. In the 1760s, the "Middlesex radicals", led by the politician John Wilkes who was expelled from the House of Commons for seditious libel, founded the Society for the Defence of the Bill of Rights and developed the belief that every man had the right to vote and "natural reason" enabled him to properly judge political issues. Liberty consisted in frequent elections. This was to begin a long tradition of British radicalism. 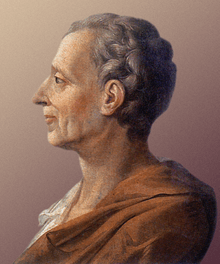 Montesquieu was a prominent figure of the French enlightenment. In particular, he argued for the separation of the powers of government in his The Spirit of the Laws (1748). In contrast to England, the French experience in the 18th century was characterized by the perpetuation of feudalism and absolutism. Ideas that challenged the status quo were often harshly repressed. Most of the philosophes of the French Enlightenment were progressive in the liberal sense and advocated the reform of the French system of government along more constitutional and liberal lines. Baron de Montesquieu wrote a series of highly influential works in the early 18th century, including Persian letters (1717) and The Spirit of the Laws (1748). The latter exerted tremendous influence, both inside and outside France. Montesquieu pleaded in favor of a constitutional system of government, the preservation of civil liberties and the law, and the idea that political institutions ought to reflect the social and geographical aspects of each community. In particular, he argued that political liberty required the separation of the powers of government. Building on John Locke's Second Treatise of Government, he advocated that the executive, legislative, and judicial functions of government should be assigned to different bodies, so that attempts by one branch of government to infringe on political liberty might be restrained by the other branches. In a lengthy discussion of the English political system, which he greatly admired, he tried to show how this might be achieved and liberty secured, even in a monarchy. He also notes that liberty cannot be secure where there is no separation of powers, even in a republic. He also emphasized the importance of a robust due process in law, including the right to a fair trial, the presumption of innocence and proportionality in the severity of punishment. Another important figure of the French Enlightenment was Voltaire. Initially believing in the constructive role an enlightened monarch could play in improving the welfare of the people, he eventually came to a new conclusion: "It is up to us to cultivate our garden". His most polemical and ferocious attacks on intolerance and religious persecutions indeed began to appear a few years later. Despite much persecution, Voltaire remained a courageous polemicist who indefatigably fought for civil rights—the right to a fair trial and freedom of religion—and who denounced the hypocrisies and injustices of the Ancien Régime. 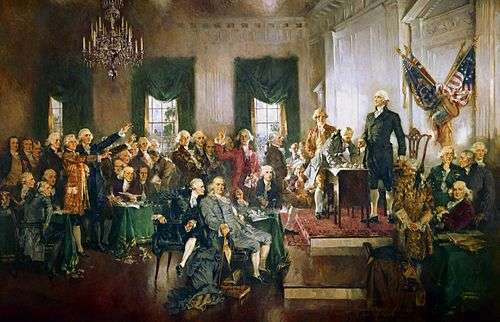 The Philadelphia Convention in 1787 adopted the United States Constitution. This established a federalist republic with three equal branches of government. Tensions between the British and the American colonies grew after the Seven Years' War over the issue of taxation without representation, culminating in the latter's decision to declare independence and face the consequences. The intellectual underpinnings for independence were provided by the English pamphleteer Thomas Paine. His Common Sense pro-independence pamphlet was anonymously published on January 10, 1776 and became an immediate success. It was read aloud everywhere, including the Army. He pioneered a style of political writing that rendered complex ideas easily intelligible. The Declaration of Independence, drafted by Thomas Jefferson, echoed Locke: "We hold these truths to be self-evident, that all men are created equal, and are endowed by their creator with certain unalienable rights, that among these are life, liberty, and the pursuit of happiness". After the war, Americans debated about how to move forward. Their first attempt at cooperation transpired under the Articles of Confederation, which were eventually regarded as too inadequate to provide security, or even a functional government. The new nation held a Constitutional Convention in 1787 to resolve the problems stemming from the Articles of Confederation. The resulting Constitution of the United States was a monumental document in American history and in world history as well. In the context of the times, the Constitution was a revolutionary and liberal document. It encoded the principles of Republicanism in the United States, stressing virtues, civic duty, rejection of royalty and aristocracy, and checks and balances against corruption of the sort that patriots detested in the British system. The first ten amendments to the constitution, known as the United States Bill of Rights, guaranteed some of the natural rights liberal thinkers used to justify the Revolution. The American theorists and politicians strongly believe in the sovereignty of the people rather than in the sovereignty of the King. As one historian writes: "The American adoption of a democratic theory that all governments derive their just powers from the consent of the governed, as it had been put as early as the Declaration of Independence, was epoch-marking". 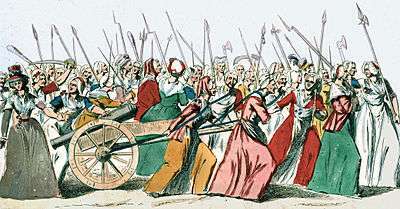 The march of the women on Versailles in October 1789, one of the most famous examples of popular political participation during the French Revolution, forced the royal court back to Paris. It would remain there until the proclamation of the First Republic in 1792. Three years into the French Revolution, German writer Johann von Goethe reportedly told the defeated Prussian soldiers after the Battle of Valmy that "from this place and from this time forth commences a new era in world history, and you can all say that you were present at its birth". Historians widely regard the Revolution as one of the most important events in human history. The Revolution is often seen as marking the "dawn of the modern era," and its convulsions are widely associated with "the triumph of liberalism". Describing the participatory politics of the French Revolution, one historian commented that "thousands of men and even many women gained firsthand experience in the political arena: they talked, read, and listened in new ways; they voted; they joined new organizations; and they marched for their political goals. Revolution became a tradition, and republicanism an enduring option". For liberals, the Revolution was their defining moment, and later liberals approved of the French Revolution almost entirely—"not only its results but the act itself," as two historians noted. A key event of the Revolution came in 1789 with the passage of the Declaration of the Rights of Man and of the Citizen. Jefferson, the American ambassador to France, was consulted in its drafting and there are striking similarities with the American Declaration of Independence. The next few years were dominated by tensions between various liberal assemblies and a conservative monarchy intent on thwarting major reforms. A republic was proclaimed in September 1792 and King Louis XVI was executed the following year. However, conflict between rival political factions, the Girondins and the Jacobins, culminated in the Reign of Terror, that was marked by mass executions of "enemies of the revolution", with the death toll reaching into the tens of thousands. Finally Napoleon came to power in 1799, ended any form of democracy with his dictatorship, ended internal civil wars, made peace with the Catholic Church, and conquered much of Europe until he went too far and was finally defeated in 1815. 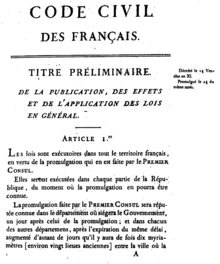 First page of Napoleon's Civil Code. The Code removed inherited privilege and allowed freedom of religion. During the Napoleonic Wars, the French brought to Western Europe the liquidation of the feudal system, the liberalization of property laws, the end of seigneurial dues, the abolition of guilds, the legalization of divorce, the disintegration of Jewish ghettos, the collapse of the Inquisition, the final end of the Holy Roman Empire, the elimination of church courts and religious authority, the establishment of the metric system, and equality under the law for all men. Napoleon wrote that "the peoples of Germany, as of France, Italy and Spain, want equality and liberal ideas," with some historians suggesting that he may have been the first person ever to use the word liberal in a political sense. He also governed through a method that one historian described as "civilian dictatorship," which "drew its legitimacy from direct consultation with the people, in the form of a plebiscite". Napoleon, however, did not always live up to the liberal ideals he espoused. His most lasting achievement, the Civil Code, served as "an object of emulation all over the globe," but it also perpetuated further discrimination against women under the banner of the "natural order". This unprecedented period of chaos and revolution had irreversibly introduced the world to a new movement and ideology that would soon criss-cross the globe. For France, however, the defeat of Napoleon brought about the restoration of the monarchy and an ultra-conservative order was reimposed on the country. The development into maturity of classical liberalism took place before and after the French Revolution in Britain, and was based on the following core concepts: classical economics, free trade, laissez-faire government with minimal intervention and taxation and a balanced budget. Classical liberals were committed to individualism, liberty and equal rights. Writers such as John Bright and Richard Cobden opposed both aristocratic privilege and property, which they saw as an impediment to the development of a class of yeoman farmers. Thomas Paine's The Rights of Man was a manifesto for political radicalism. The radical liberal movement began in the 1790s in England and concentrated on parliamentary and electoral reform, emphasizing natural rights and popular sovereignty. Radicals like Richard Price and Joseph Priestley saw parliamentary reform as a first step toward dealing with their many grievances, including the treatment of Protestant Dissenters, the slave trade, high prices and high taxes. Thomas Paine's The Rights of Man (1791) provoked a response from Burke, with his conservative essay Reflections on the Revolution in France. The ensuing Revolution Controversy featured, among others, Mary Wollstonecraft, who followed with an early feminist tract A Vindication of the Rights of Woman. Radicals encouraged mass support for democratic reform along with rejection of the monarchy, aristocracy, and all forms of privilege. Different strands of the movement developed, with middle class "reformers" aiming to widen the franchise to represent commercial and industrial interests and towns without parliamentary representation, while "Popular radicals" drawn from the middle class and from artisans agitated to assert wider rights including relieving distress. 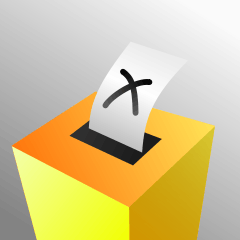 The theoretical basis for electoral reform was provided by "Philosophical radicals" who followed the utilitarian philosophy of Jeremy Bentham and strongly supported parliamentary reform, but were generally hostile to the arguments and tactics of the "popular radicals". Improved economic conditions after 1821, improvements in economic and criminal law and the abandoning of policies of repression led to decreasing polarisation and a more consensual form of reform politics that was to dominate in Britain for the next two centuries. In 1823 Jeremy Bentham co-founded the Westminster Review with James Mill as a journal for "philosophical radicals", setting out the utilitarian philosophy. The Reform Act 1832 was put through with the support of public outcry, mass meetings of "political unions" and riots in some cities. This now enfranchised the middle classes, but failed to meet radical demands. Following the Reform Act the mainly aristocratic Whigs in the House of Commons were joined by a small number of parliamentary Radicals, as well as an increased number of middle class Whigs. By 1839 they were informally being called "the Liberal party. The Liberals produced one of the greatest British prime ministers—William Gladstone, who was also known as the Grand Old Man and was the towering political figure of liberalism in the 19th century. Under Gladstone, the Liberals reformed education, disestablished the Church of Ireland, and introduced the secret ballot for local and parliamentary elections. 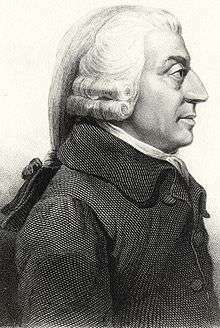 Adam Smith argued for free trade and low levels of government regulation. The primary intellectual influences on 19th century liberal trends were those of Adam Smith and the classical economists, and Jeremy Bentham and John Stuart Mill. Smith wrote that as long as supply, demand, prices, and competition were left free of government regulation, the pursuit of material self-interest, rather than altruism, would maximize the wealth of a society through profit-driven production of goods and services. An "invisible hand" directed individuals and firms to work toward the nation's good as an unintended consequence of efforts to maximize their own gain. This provided a moral justification for the accumulation of wealth, which had previously been viewed by some as sinful. He assumed that workers could be paid as low as was necessary for their survival, which was later transformed by David Ricardo and Thomas Malthus into the "Iron Law of Wages". His main emphasis was on the benefit of free internal and international trade, which he thought could increase wealth through specialization in production. He also opposed restrictive trade preferences, state grants of monopolies, and employers' organisations and trade unions. Government should be limited to defence, public works and the administration of justice, financed by taxes based on income. In addition to Adam Smith's legacy, Say's law, Malthus theories of population and Ricardo's iron law of wages became central doctrines of classical economics. Jean Baptiste Say challenged Smith's labour theory of value, believing that prices were determined by utility and also emphasised the critical role of the entrepreneur in the economy. However neither of those observations became accepted by British economists at the time. Thomas Malthus wrote An essay on the principle of population in 1798, becoming a major influence on classical liberalism. Malthus claimed that population growth would outstrip food production, because population grew geometrically, while food production grew arithmetically. As people were provided with food, they would reproduce until their growth outstripped the food supply. Nature would then provide a check to growth in the forms of vice and misery. No gains in income could prevent this, and any welfare for the poor would be self-defeating. The poor were in fact responsible for their own problems which could have been avoided through self-restraint. 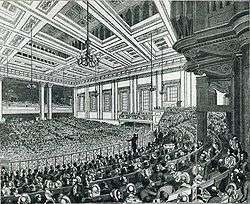 A meeting of the Anti-Corn Law League in Exeter Hall in 1846. The repeal of the Corn Laws in 1846 was a watershed moment and encapsulated the triumph of free trade and liberal economics. The Anti-Corn Law League brought together a coalition of liberal and radical groups in support of free trade under the leadership of Richard Cobden and John Bright, who opposed militarism and public expenditure. Their policies of low public expenditure and low taxation were later adopted by the liberal chancellor of the exchequer and later prime minister, William Ewart Gladstone. Several liberals, including Adam Smith and Richard Cobden, argued that the free exchange of goods between nations would lead to world peace. Smith argued that as societies progressed, the spoils of war would rise but the costs of war would rise further, making war difficult and costly for industrialised nations. Cobden believed that military expenditures worsened the welfare of the state and benefited a small but concentrated elite minority, summing up British imperialism, which he believed was the result of the economic restrictions of mercantilist policies. To Cobden, and many classical liberals, those who advocated peace must also advocate free markets. 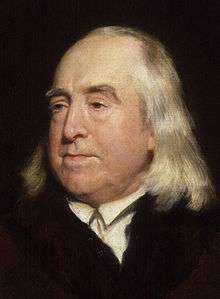 Jeremy Bentham's philosophy counseled government to adopt policies that could bestow the greatest possible social benefit. Commitment to laissez-faire, however, was not uniform. Some economists advocated state support of public works and education. Classical liberals were also divided on free trade. David Ricardo expressed doubt that the removal of grain tariffs would have any general benefits. Most classical liberals also supported legislation to regulate the number of hours that children were allowed to work and usually did not oppose factory reform legislation. Despite the pragmatism of classical economists, their views were expressed in dogmatic terms by such popular writers as Jane Marcet and Harriet Martineau. 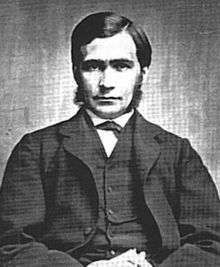 The strongest defender of laissez-faire was The Economist founded by James Wilson in 1843. The Economist criticised Ricardo for his lack of support for free trade and expressed hostility to welfare, believing that the lower orders were responsible for their economic circumstances. The Economist took the position that regulation of factory hours was harmful to workers and also strongly opposed state support for education, health, the provision of water, and granting of patents and copyrights. Although classical liberals aspired to a minimum of state activity, they eventually accepted the principle of government intervention in the economy from the early 19th century with the passage of the Factory Acts. From around 1840 to 1860, laissez-faire advocates of the Manchester School and writers in The Economist were confident that their early victories would lead to a period of expanding economic and personal liberty and world peace but would face reversals as government intervention and activity continued to expand from the 1850s. Jeremy Bentham and James Mill, although advocates of laissez-faire, non-intervention in foreign affairs, and individual liberty, believed that social institutions could be rationally redesigned through the principles of Utilitarianism. By the 1870s, Herbert Spencer and other classical liberals concluded that historical development was turning against them. By the First World War, the Liberal Party had largely abandoned classical liberal principles. Abolitionist and manhood suffrage movements spread, along with representative and democratic ideals. The fall of Napoleon in 1814–15 brought back to power in France the reactionary Bourbon kings. However even they were unable to reverse the liberalization of the French Revolution and they were overthrown in 1830. Likewise The fall of Napoleon brought conservatives to power across much of Europe. However nationalism also spread rapidly after 1815. A mixture of liberal and nationalist sentiment in Italy and Germany brought about the unification of the two countries in the late 19th century. A liberal regime came to power in Italy, and ended the secular power of the popes. The Vatican, however, launched a counter crusade against liberalism. Pope Pius IX issued the Syllabus of Errors in 1864, condemning liberalism in all its forms. In many countries, liberal forces responded by expelling the Jesuit order. In Germany, unification brought to power the leading conservative of the nineteenth century, Otto von Bismarck, a member of the landholding Junker aristocracy. In order to secure the loyalty of the working classes to the ruling aristocracy, Bismarck introduced both universal male suffrage and the first welfare state. Bismarck first formed a coalition with the liberals, with a focus on ending trade restrictions and reducing the power of the Catholic Church. By the late 1870s he then reversed positions, and began collaborating with Catholics. He's best known for a foreign-policy that balanced multiple competing interests to produce a peaceful era. Liberal agitation in Latin America led to independence from the imperial power of Spain and Portugal. The new regimes were generally liberal in their political outlook, and employed the philosophy of positivism, which emphasized the truth of modern science, to buttress their positions. 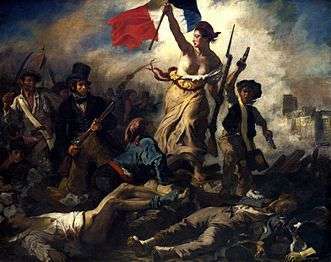 The iconic painting Liberty Leading the People by Eugène Delacroix, a tableau of the July Revolution in 1830. In long-term historical perspective, Norman Davies has argued that Freemasonry was a powerful force on behalf of Liberalism in Europe and its colonies, from about 1700 to the twentieth century. It expanded rapidly during the Age of Enlightenment, reaching practically every country in Europe, as well as the British and Spanish overseas colonies. It was especially attractive to royalty, powerful aristocrats and politicians as well as intellectuals, artists and political activists. Its great enemy was the Roman Catholic Church, so that in countries with a large Catholic element, such as France, Italy, Austria, Spain, and Mexico, much of the ferocity of the political battles involve the confrontation between the conservatives centered around the Church and liberals who were often Freemasons. By the 1820s, every regiment of the British Army had at least one Masonic chapter, and they set about to form chapters among civilians everywhere they were stationed in the British Empire. In the French, Spanish, and Portuguese empires, Army chapters were also active in spreading Freemasonry. In 19th and early 20th century Mexico, practically all the important leaders of liberalism were active Freemasons; they used their lodges as devices for political organization. Twentieth century totalitarian movements, especially the Fascists and Communists when they came to power, set out to systematically crush the Freemason organizations in their countries. In France, the July Revolution of 1830, orchestrated by liberal politicians and journalists, removed the Bourbon monarchy and inspired similar uprisings elsewhere in Europe. Frustration with the pace of political progress in the early 19th century sparked even more gigantic revolutions in 1848. Revolutions spread throughout the Austrian Empire, the German states, and the Italian states. Governments fell rapidly. Liberal nationalists demanded written constitutions, representative assemblies, greater suffrage rights, and freedom of the press. A second republic was proclaimed in France. Serfdom was abolished in Prussia, Galicia, Bohemia, and Hungary. The supposedly indomitable Metternich, the Austrian builder of the reigning conservative order, shocked Europe when he resigned and fled to Britain in panic and disguise. Quickly the success of the revolutionaries petered out. Without French help, the Italians were easily defeated by the Austrians. With some luck and skill, Austria also managed to contain the bubbling nationalist sentiments in Germany and Hungary, helped along by the failure of the Frankfurt Assembly to unify the German states into a single nation. Two decades later, however, the Italians and the Germans realized their dreams for unification and independence. The Sardinian Prime Minister, Camillo di Cavour, was a shrewd liberal who understood that the only effective way for the Italians to gain independence was if the French were on their side. Napoleon III agreed to Cavour's request for assistance and France defeated Austria in the Franco-Austrian War of 1859, setting the stage for Italian independence. German unification transpired under the leadership of Otto von Bismarck, who decimated the enemies of Prussia in war after war, finally triumphing against France in 1871 and proclaiming the German Empire in the Hall of Mirrors at Versailles, ending another saga in the drive for nationalization. The French proclaimed a third republic after their loss in the war. 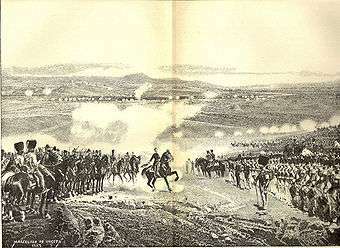 The Spanish Liberals prepare to attack the Carlists in the Battle of Mendigorría (1835). Liberal principles began to spread around Europe from the mid 19th century, especially as a result of the wave of revolutions in 1848. In Spain, the Liberales, the first group to use the liberal label in a political context, fought for the implementation of the 1812 Constitution for decades—overthrowing the monarchy in 1820 as part of the Trienio Liberal and defeating the conservative Carlists in the 1830s. The liberal and conservative struggles in Spain also replicated themselves in Latin America. Like its former master, the region was a hotbed of wars, conflicts, and revolutionary activity throughout the 19th century. In Mexico, the liberales instituted the program of La Reforma in the 1850s, reducing the power of the military and the Catholic Church. The conservadores were outraged at these steps and launched a revolt, which sparked a deadly conflict. From 1857 to 1861, Mexico was gripped in the bloody War of Reform, a massive internal and ideological confrontation between the liberals and the conservatives. The liberals eventually triumphed and Benito Juárez, a dedicated liberal and now a Mexican national hero, became the president of the republic. After Juárez, Mexico suffered from prolonged periods of dictatorial repression, which lasted until the Mexican Revolution in the early 20th century. Another regional example of liberal influence can be found in Ecuador. As with other nations throughout the region at the time, Ecuador was steeped in conflict and uncertainty after gaining independence from Spain. By the middle of the 19th century, the country had descended into chaos and madness, with the people divided between rival liberal and conservative camps. From these conflicts, García Moreno established a conservative government that ruled the country for several years. The liberals, however, were incensed at the conservative regime and overthrew it completely in the Liberal Revolution of 1895. The Radical Liberals who toppled the conservatives were led by Eloy Alfaro, a firebrand who implemented a variety of sociopolitical reforms, including the separation of church and state, the legalization of divorce, and the establishment of public schools. John Stuart Mill's On Liberty greatly influenced the course of 19th century liberalism. By the end of the nineteenth century, the principles of classical liberalism were being increasingly challenged by downturns in economic growth, a growing perception of the evils of poverty, unemployment and relative deprivation present within modern industrial cities, and the agitation of organized labour. The ideal of the self-made individual, who through hard work and talent could make his or her place in the world, seemed increasingly implausible. A major political reaction against the changes introduced by industrialisation and laissez-faire capitalism came from conservatives concerned about social balance, although socialism later became a more important force for change and reform. Some Victorian writers—including Charles Dickens, Thomas Carlyle, and Matthew Arnold—became early influential critics of social injustice. 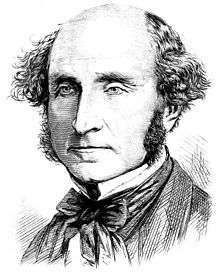 John Stuart Mill contributed enormously to liberal thought by combining elements of classical liberalism with what eventually became known as the new liberalism. Mill's 1859 On Liberty addressed the nature and limits of the power that can be legitimately exercised by society over the individual. He gives an impassioned defence of free speech, arguing that free discourse is a necessary condition for intellectual and social progress. Mill defined "social liberty" as protection from "the tyranny of political rulers." He introduced a number of different concepts of the form tyranny can take, referred to as social tyranny, and tyranny of the majority respectively. Social liberty meant limits on the ruler's power through obtaining recognition of political liberties or rights and by the establishment of a system of "constitutional checks". Liberal philosopher T.H. Green began to espouse a more interventionist government approach. His definition of liberty, influenced by Joseph Priestley and Josiah Warren, was that the individual ought to be free to do as he wishes unless he harms others. Mill was also an early proponent of feminism. In his article, "The Subjection of Women" (1861, published 1869), Mill attempted to prove that the legal subjugation of women is wrong and that it should give way to perfect equality. However, although Mill' initial economic philosophy supported free markets and argued that progressive taxation penalised those who worked harder, he later altered his views toward a more socialist bent, adding chapters to his Principles of Political Economy in defence of a socialist outlook, and defending some socialist causes, including the radical proposal that the whole wage system be abolished in favour of a co-operative wage system. Another early liberal convert to greater government intervention was Thomas Hill Green. He believed that the state should foster and protect the social, political and economic environments in which individuals will have the best chance of acting according to their consciences. The state should intervene only where there is a clear, proven and strong tendency of a liberty to enslave the individual. Green regarded the national state as legitimate only to the extent that it upholds a system of rights and obligations that is most likely to foster individual self-realisation. 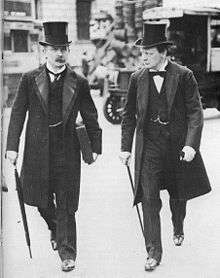 Liberal politicians David Lloyd George and Winston Churchill enacted the 1909 People's Budget. The Budget specifically aimed at the redistribution of wealth. The "New Liberalism" or social liberalism movement emerged about 1900 in Britain. The New Liberals, which included intellectuals like L.T. Hobhouse, and John A. Hobson, saw individual liberty as something achievable only under favorable social and economic circumstances. In their view, the poverty, squalor, and ignorance in which many people lived made it impossible for freedom and individuality to flourish. New Liberals believed that these conditions could be ameliorated only through collective action coordinated by a strong, welfare-oriented, and interventionist state. The Liberals, under Henry Campbell-Bannerman and later H.H. Asquith, returned with full strength in the general election of 1906, aided by working class voters worried about food prices. After that historic victory, the Liberal Party introduced various reforms, including health insurance, unemployment insurance, and pensions for elderly workers, thereby laying the groundwork for the future British welfare state. The People's Budget of 1909, championed by David Lloyd George and fellow liberal Winston Churchill, introduced unprecedented taxes on the wealthy in Britain and radical social welfare programmes to the country's policies. It was the first budget with the expressed intent of redistributing wealth among the public. It imposed increased taxes on luxuries, liquor, tobacco, incomes, and land, - taxation that disproportionately affected the rich - so that money could be made available for new welfare programmes as well as new battleships. In 1911 Lloyd George succeeded in putting through Parliament his National Insurance Act, making provision for sickness and invalidism, and this was followed by his Unemployment Insurance Act. Although still partially informed by older Liberal concerns for character, self-reliance, and the capitalist market, this legislation nevertheless, marked a significant shift in Liberal approaches to the state and social reform, approaches that later governments would slowly expand and that would grow into the welfare state after the Second World War. What was new in these reforms was the underlying assumption that the state could be a positive force, that the measure of individual freedom... was not how much the state left people alone, but whether he gave them the capacity to fill themselves as individuals. The incompetence of the ruling class in Russia discredited the monarchy and aristocracy. Russia was already reeling from earlier losses to Japan and political struggles with the Kadets, a powerful liberal bloc in the Duma. Facing huge shortages in basic necessities along with widespread riots in early 1917, Czar Nicholas II abdicated in March, bringing to an end three centuries of Romanov rule and paving the way for liberals to declare a republic. Russia's liberals, repeatedly used the slogans, symbols, and ideas of the French Revolution — plastering liberté, égalité, fraternité over major public spaces — to establish an emotional attachment to the past, an attachment that liberals hoped would galvanize the public to fight for modern values. The Great Depression with its periods of worldwide economic hardship formed the backdrop against which John Maynard Keynes's revolution took place. 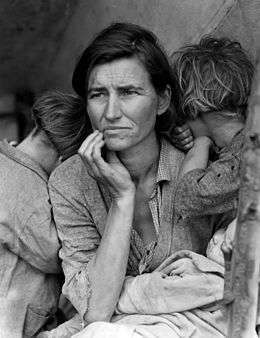 The image is Dorothea Lange's Migrant Mother depiction of destitute pea-pickers in California, taken in March 1936. But democracy was no simple task, and the Provisional Government that took over the country's administration needed the cooperation of the Petrograd Soviet, an organization that united leftist industrial laborers, to function and survive. Under the uncertain leadership of Alexander Kerensky, however, the Provisional Government mismanaged Russia's continuing involvement in the war, prompting angry reactions from the Petrograd workers, who drifted further and further to the left. The Bolsheviks, a communist group led by Vladimir Lenin, seized the political opportunity from this confusion and launched a second revolution in Russia during the same year. The communists violently overthrew the fragile liberal-socialist order in October, after which Russia witnessed several years of civil war between communists and conservatives wishing to restore the monarchy. The worldwide Great Depression, starting in 1929, hastened the discrediting of liberal economics and strengthened calls for state control over economic affairs. Economic woes prompted widespread unrest in the European political world, leading to the rise of fascism as an ideology and a movement arrayed against both liberalism and communism, especially in Nazi Germany and Italy. Broadly speaking, fascist ideology emphasized elite rule and absolute leadership, a radical rejection of equality, the imposition of patriarchal society, a stern commitment to war as an instrument of natural behavior, the elimination of supposedly inferior or subhuman groups from the structure of the nation, and the conception of life as an "unending struggle" in which the strong would destroy and dominate the weak. Meanwhile, Portugal, Austria, Poland, Greece, the Baltic Republics and Spain became authoritarian regimes, or were swallowed up by Germany and the Soviet Union. Apart from Switzerland and Sweden, democracy on the European continent was extinguished by the Germans after 1940, when the authoritarian Vichy regime took control in conquered France . The rise of fascism in the 1930s eventually culminated in the Second World War, the deadliest conflict in human history. The Allies prevailed in the war by 1945, and their victory set the stage for the Cold War between the communist Eastern Bloc and the liberal Western Alliance. John Maynard Keynes was one of the most influential economists of modern times. His ideas, which are still widely felt, formalized modern liberal economic policy. Meanwhile, the definitive liberal response to the Great Depression was given by the British economist John Maynard Keynes, who had begun a theoretical work examining the relationship between unemployment, money and prices back in the 1920s. 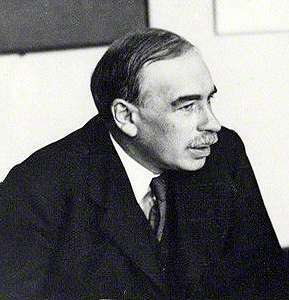 Keynes was deeply critical of the British government's austerity measures during the Great Depression. He believed that budget deficits were a good thing, a product of recessions. He wrote, "For Government borrowing of one kind or another is nature's remedy, so to speak, for preventing business losses from being, in so severe a slump as to present one, so great as to bring production altogether to a standstill." At the height of the Great Depression, in 1933, Keynes published The Means to Prosperity, which contained specific policy recommendations for tackling unemployment in a global recession, chiefly counter cyclical public spending. The Means to Prosperity contains one of the first mentions of the multiplier effect. Keynes's magnum opus, The General Theory of Employment, Interest and Money was published in 1936, and served as a theoretical justification for the interventionist policies Keynes favoured for tackling a recession. The General Theory challenged the earlier neo-classical economic paradigm, which had held that provided it was unfettered by government interference, the market would naturally establish full employment equilibrium. Classical economists had believed in Say's law, which, simply put, states that "supply creates its own demand", and that in a free market workers would always be willing to lower their wages to a level where employers could profitably offer them jobs. An innovation from Keynes was the concept of price stickiness – the recognition that in reality workers often refuse to lower their wage demands even in cases where a classical economist might argue it is rational for them to do so. Due in part to price stickiness, it was established that the interaction of "aggregate demand" and "aggregate supply" may lead to stable unemployment equilibria – and in those cases, it is the state, and not the market, that economies must depend on for their salvation. The book advocated activist economic policy by government to stimulate demand in times of high unemployment, for example by spending on public works. "Let us be up and doing, using our idle resources to increase our wealth," he wrote in 1928. "With men and plants unemployed, it is ridiculous to say that we cannot afford these new developments. It is precisely with these plants and these men that we shall afford them." Where the market failed to properly allocate resources, the government was required to stimulate the economy until private funds could start flowing again—a "prime the pump" kind of strategy designed to boost industrial production. Unskilled laborers working for the Works Progress Administration, a New Deal agency that employed millions of people during the Great Depression. Putting the unemployed to work through public programs is a key tenet of social liberalism. The social liberal program launched by President Roosevelt in the United States, the New Deal, proved very popular with the American public. In 1933, when FDR came into office, the unemployment rate stood at roughly 25 percent. The size of the economy, measured by the gross national product, had fallen to half the value it had in early 1929. The electoral victories of FDR and the Democrats precipitated a deluge of deficit spending and public works programs. In 1940, the level of unemployment had fallen by 10 points to around 15 percent. Additional state spending and the gigantic public works program sparked by the Second World War eventually pulled the United States out of the Great Depression. From 1940 to 1941, government spending increased by 59 percent, the gross domestic product skyrocketed 17 percent, and unemployment fell below 10 percent for the first time since 1929. By 1945, after vast government spending, public debt stood at a staggering 120 percent of GNP, but unemployment had been effectively eliminated. Most nations that emerged from the Great Depression did so with deficit spending and strong intervention from the state. The comprehensive welfare state was built in the UK after the Second World War, although largely accomplished by the Labour Party, was significantly designed by two Liberals—John Maynard Keynes, who laid the economic foundations, and William Beveridge, who designed the welfare system. After various global and catastrophic events, including wars and economic collapses, this new kind of liberalism would sweep over much of the world in the 20th century. This classical liberal renewal, sometimes called libertarianism, lasted through the 1980s and the 1990s, although recent economic troubles have prompted a resurgence in Keynesian economic thought. Meanwhile, nearing the end of the 20th century, communist states in Eastern Europe collapsed precipitously, leaving liberal democracies as the only major forms of government in the West. At the beginning of the Second World War, the number of democracies around the world was about the same as it had been forty years before. After 1945, liberal democracies spread very quickly. Even as late as 1974, roughly 75 percent of all nations were considered dictatorial, but now more than half of all countries are democracies. Liberalism faces recurring challenges, however, including conservatism and religious fundamentalism in several regions throughout the world. The rise of China is also challenging Western liberalism with a combination of authoritarian government and economic reforms that preceded democratization. French intellectual Michel Foucault locates the emergence of liberalism, both as a political philosophy and a mode of governance, in the sixteenth century. He especially focuses on Adam Smith, David Hume and Adam Ferguson. According to Foucault, it was through a double movement, of state centralisation on the one hand and of dispersion and religious dissidence on the other, that this problem of government presented itself clearly for the first time. ↑ "The Rise, Decline, and Reemergence of Classical Liberalism". Retrieved 2012-12-17. ↑ Doherty 2007, p. 26. ↑ West 1996, p. xv. 1 2 3 Kerber, p. 189. ↑ Steven Pincus (2009). 1688: The First Modern Revolution. Yale University Press. Retrieved 2013-02-07. ↑ "England's revolution". Retrieved 2012-12-17. ↑ Windeyer, W. J. Victor (1938). "Essays". In Windeyer, William John Victor. Lectures on Legal History. Law Book Co. of Australasia. ↑ John J. Patrick; Gerald P. Long (1999). Constitutional Debates on Freedom of Religion: A Documentary History. Westport, CT: Greenwood Press. ↑ Colton and Palmer, p. 333. ↑ "Letter on the subject of Candide, to the Journal encyclopédique July 15, 1759". University of Chicago. Archived from the original on 13 October 2006. Retrieved 7 January 2008. 1 2 Hitchens, Christopher (2006). Thomas Paine's Rights of Man. Grove Press. p. 37. ISBN 0-8021-4383-0. ↑ Oliphant, John. "Paine,Thomas". Encyclopedia of the American Revolution: Library of Military History. Charles Scribner's Sons. Retrieved April 10, 2007 – via Gale Virtual Library. (subscription required (help)). ↑ Merrill Jensen, The Founding of a Nation: A History of the American Revolution, 1763–1776 (New York: Oxford University Press, 1968), p. 668. ↑ Milan Zafirovski (2007). Liberal Modernity and Its Adversaries: Freedom, Liberalism and Anti-Liberalism in the 21st Century. BRILL. pp. 237–38. ↑ Spielvogel, Jackson (2011). Western Civilization: Since 1300. Cengage Learning. p. 578. ↑ Adams, Willi Paul (2001). The First American Constitutions: Republican Ideology and the Making of the State Constitutions in the Revolutionary Era. Rowman & Littlefield. pp. 128–29. ↑ Manent and Seigel, p. 80. ↑ Jon Meacham (2014). Thomas Jefferson: President and Philosopher. Random House. p. 131. ↑ David Andress, The terror: Civil war in the French revolution 2005). ↑ Colton and Palmer, pp. 428–29. 1 2 Colton and Palmer, p. 428. ↑ Margaret C. Jacob, Living the Enlightenment: Freemasonry and politics in eighteenth-century Europe (Oxford University Press, 1991). ↑ Jessica Harland-Jacobs (2007). Builders of Empire: Freemasons and British Imperialism, 1717–1927. U North Carolina Press. pp. 15–16. ↑ J.P. Daughton (2006). An Empire Divided:Religion, Republicanism, and the Making of French Colonialism, 1880–1914. Oxford University Press. p. 89. ↑ Michael S. Werner (2001). Concise Encyclopedia of Mexico. Taylor & Francis. pp. 88, 610. ↑ Jürgen Buchenau; William H. Beezley (2009). State Governors in the Mexican Revolution, 1910–1952: Portraits in Conflict, Courage, and Corruption. Rowman & Littlefield. p. 21. ↑ William Langer, The revolutions of 1848 (1971). ↑ Arthur James May, ed., The age of Metternich, 1814–1848 (1963) readings in primary and secondary sources. ↑ Colton and Palmer, pp. 546–47. 1 2 Stacy, p. 698. ↑ Eatwell, Roger; Wright, Anthony (1999). Contemporary political ideologies. Continuum International Publishing Group. ISBN 9780826451736. ↑ IREF | Pour la liberte economique et la concurrence fiscale (PDF) Archived March 27, 2009, at the Wayback Machine. ↑ Michael Freeden, The New Liberalism: An Ideology of Social Reform (Oxford UP, 1978). 1 2 Adams, Ian (2001). Political Ideology Today (Politics Today). Manchester: Manchester University Press. ISBN 0719060206. ↑ Peter Weiler, "New Liberalism" in Fred M. Leventhal, ed., Twentieth-century Britain: an encyclopedia (Garland, 1995) pp. 564–65. ↑ Pressman, Steven (1999). Fifty Great Economists. London: London: routledge. pp. 96–100. ISBN 0-415-13481-1. 1 2 Cassidy, John (10 October 2011). "The Demand Doctor". The New Yorker. ↑ Skidelsky, Robert (2003). John Maynard Keynes: 1883–1946: Economist, Philosopher, Statesman. Pan MacMillan Ltd. pp. 494–500, 504, 509–510. ISBN 0-330-488678. ↑ "If you analyze it I believe the very heart and soul of conservatism is libertarianism." KeKerber, Linda. "The Republican Mother". Baltimore: Johns Hopkins University Press, 1976.